A CTA2 Multi-Dimensional character has 10 view angles. In the short video below that I put together especially for this post you can see the monkey character has been imported into CTA2 and is animated walking forward. It's still a little rough (and I"m not sure why he's missing a pupil because it's certainly there in the template) but I wanted to show you not just how the character looks but also demonstrate how the bones exist in 3D space to animate the character. You'll notice from the above video that the software is automatically working out the perspective on the character so that the foot and hand closest to the camera appears larger than the ones further away. If you look at the lower inset video you can see the actual bone structure in action (you may have to watch the video at full screen to see it). What this 3D bone structure does is makes a CTA2 G2 (i.e. Multi-Dimensional) character seem more like a fully rounded character that has form, body structure and occupies real space. Unlike CTA1 characters, such as my Cool Froyd the cat, whose body appears very flat and, when I do move his limbs, they have a less natural movement to them. Previously in CTA1 to create a flash based character (as opposed to a bitmap based character) you had to import each component of the character individually e.g. hand, forearm, upper arm, eyes, nose, etc. This new way, via template, whilst it is something of an improvement doesn't do a whole lot to speed up the process. Though I'm fairly certain it's quicker than importing every component individually for a G2 character (which is what you'll have to do if you didn't purchase the Pipeline version of CTA2). I'm not that comfortable drawing in DrawPlus either because it is entirely vector based. Despite it being the only software I own that fully supports my Wacom tablet, right down to reprogramming the buttons to commonly used tools, it doesn't feel natural to draw with. Plus I'm from the school where drawing a freehand vector line is a definite no, no as it creates far too many points. Which means I have to draw by manipulating shapes and that doesn't feel natural or fun. Maybe I'm just not used to drawing that way yet. Nothing beats drawing for real with a regular HB pencil on paper. Back to the software. 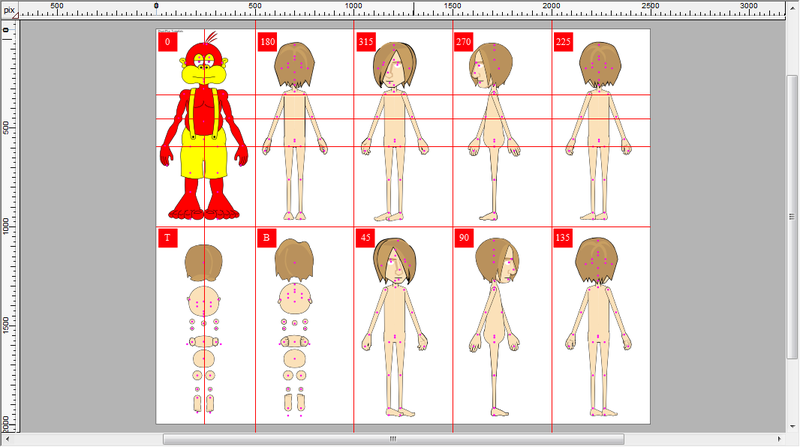 I've also had trouble with the layer order of body parts. View angle zero (the one I'm working on) sets the layer order for all the other views to base themselves upon. However when I import the character the layer order seems to change. I've yet to work out in CTA2 how to change the layering for the default character pose. I know how to change the layer order of body parts whilst key framing the animation but I don't want to have to do that every single time I animate the character just because the default pose starts the laying out wrong. 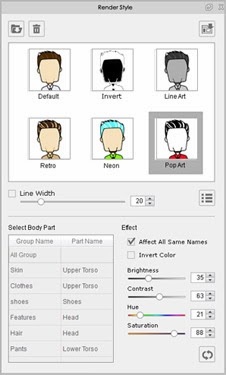 One other thing I'm trying to do is allow this character to utilize automatic colour styles that can be applied with a single click (see the image right for an example of some of the styles available). One thing you can do is remove all the character outlines. However, for those of you familiar with vector drawing, for some reason, my 'open' shapes that have an outline, retain their outline when this style is applied? Something else you may have noticed is my monkey doesn't have a tail. This is because the template doesn't include the tail segments of CTA2 characters. I'll add that in once I've imported the entire main character. I think that's all I wanted to highlight thus far. It's taking longer than expected because I'm trying to solve all my problems using the zero degree view first. Once I have that the other views should come together much quicker as many of the parts can be adapted from the zero and subsequent angles as I draw them. I hope you've found this insight into custom CTA2 character creation useful and, if you are considering buying CTA2 Pipeline for this very reason, you take the phrase "Easily create multi-dimensional characters..." used in the promotion with a very 'relative' grain of salt. Great site on Reallusion stuff. I was reading a few of your articles and thinking, this guy is just like me, as I've bought all their stuff too. The template feature seems great once you get the first few characters out of the way. I am just getting started making the Drawplus characters as well, but love the vector idea since I can't draw to save my life. Thanks for posting and I'll keep reading. I didn't intentionally plan to buy all of Reallusion's software but when they offered a package deal that contained most of it at a heavily discounted price (70% off!) and threw in CTA2 for free I figured that was a good time to buy. Especially since I knew a lot of the UI for iclone 5 is very similar to CTA2. Please, I need the dummy example in fla. Yes I do have it and, if you have purchased the Pipeline version of CTA2 then you should be able to download it from your Reallusion member account. I don't send out files that I had to pay for myself to get them.